Here’s another tip: The best time to switch during an election year is October. Your volume of mail decreases, giving you time to prepare your letters, mail, and casework for the next Congress. Roll into the 116th Congress with a brand-new, more efficient, easy-to-use CRM system — one that is user-focused, to guarantee you the best experience possible. Fireside has mastered prompt, thorough database transitions. Having switched over 120 clients already, we can assure you that you’ll be able to continue to work uninterrupted throughout the process. Once you decide to switch your contract — which you can do at any time — you’ll be running a constituent relationship management system created just for you in six weeks or less. Here’s what the process entails: Your old provider will take a full snapshot of everything in your database. Our experienced experts will review it thoroughly, checking for any incomplete files and ensuring that all your information is ready and waiting when you log into Fireside. As a one-stop shop, Fireside offers CRM outreach tools, including an email system and newsletter platform, award-winning website design, and the ability to run telephone town halls that are fully integrated with your database. All your answers in one place — that’s Fireside. Housenet shows the services and service costs associated with every congressional CRM provider. Guess what? They all cost about the same. But not all dollars are spent equally. Some providers don’t offer services where their newsletter is integrated with their website or they can't post to social media directly from their CRM. Others can’t prevent duplicate records from being created in your database. While the pricing for all CRM systems might be similar, not all databases are worth the price you pay to get them work the way you want. Switch to Fireside and get more bang for your buck. Every CRM company claims to have 99% customer satisfaction on Capitol Hill, but Fireside has the stats, comments, and tools to prove it. 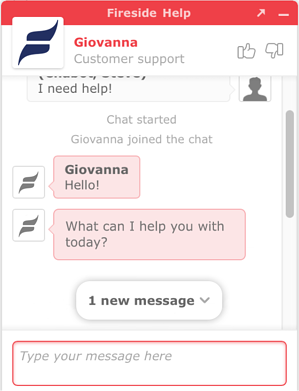 As the only provider using Instant Chat, we can respond to your questions in 15 seconds or less. Don’t believe it? Try us right now. Since many of our specialists who respond to chat requests are former Capitol Hill staffers, we are able to answer your queries quickly and offer more efficient ways to accomplish the task at hand. We’ve done the job, we’ve seen support from both sides, and we draw on our Hill experiences to ensure true customer satisfaction. We know work doesn’t stop for you even on a Saturday, so we’ve made it easy to contact us on weekends to make sure you can always get the help you need. This is what 99% satisfaction looks like. Fireside was created by techies and crafted for Congress, bringing simplicity to the complexity of the Hill. But we are more than that: Over 35% of our employees are former Hill staffers, so we truly understand your job and your responsibilities. We know how hard your job can be, but we want you to love it. For years, our support team has been working exclusively with members of Congress and their staff. Our developers frequently interview our clients on the Hill to find out what changes we can make to improve your experience as we drive our technological capabilities further than ever before. We strive to put the best possible product at your fingertips. From the first day you arrive on the Hill, we will support you every step of the way. With Fireside on your side, you can focus on doing your best work.